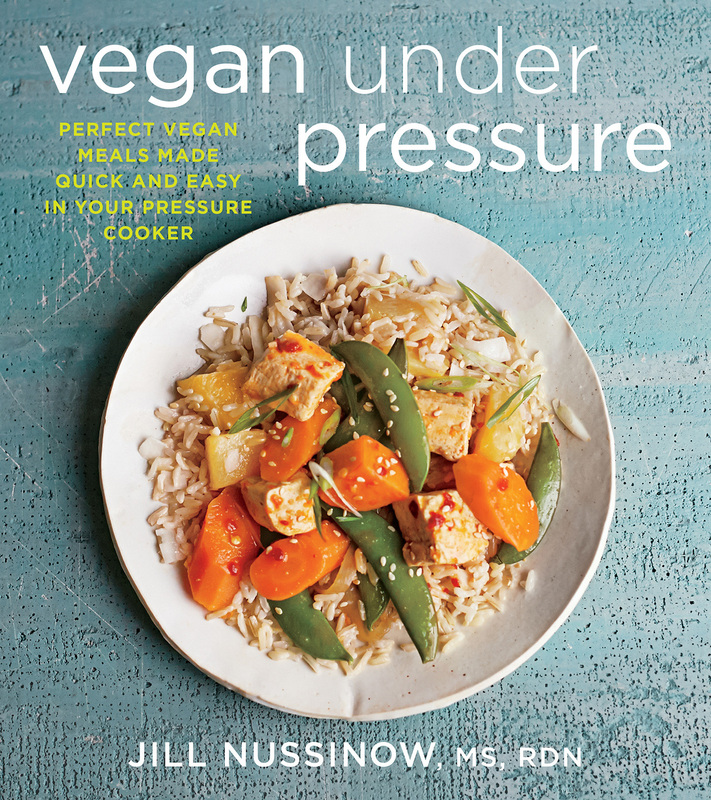 I was very happy to be asked to review Jill Nussinow's brand-new book, "Vegan Under Pressure", especially because I had recently purchased a new Instant Pot IP-DUO60. Jill's book "The New Fast Food" has been a wonderful introduction to healthful, quick, easy and delicious vegan pressure cooking, and I found her cooking time charts the most accurate of many that I had perused. (No more mushy beans!) So, I was excited to see the new book, which had the addition of information on pressure cooking in the increasingly popular Instant Pot. The book is colorful, with a very pleasant layout and colors that are easy on the eye. In Chapters One and Two, Jill leads you by the hand as you embark on your first encounter with a pressure cooker-- whether it be with an old "jiggle-top" version, a modern stove-top version, an electric pressure cooker, or the Instant Pot (which is a pressure cooker, slow cooker, rice cooker/porridge maker, steamer, yogurt maker, warming device, and it has a sauté/browning function). I have had some experience with all of those types of pressure cookers over the years and my mother used a pressure cooker sometimes (though I wasn't really paying attention at that point in my life), but I still benefited immensely from reading the introductory chapters. 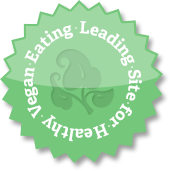 I use all sorts of cooking methods in my kitchen, but find that the pressure cooker or Instant Pot is a great tool particularly for vegans. It makes quick work of cooking your own beans from the dry state, and cooking whole grains and homemade vegan soups and stews. 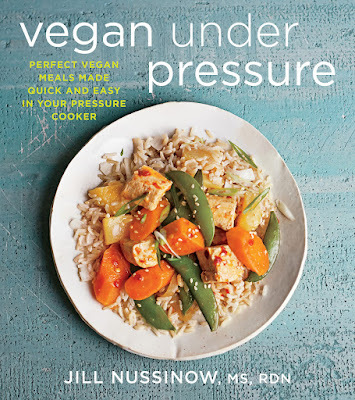 In Chapter One, Jill first explains how the pressure cooker can not only save you time, but also fuel, calories (most of Jill's recipes are very low in fat), and nutrients (and water, if that's a concern-- you don't need much for many types of food); how it differs from a slow cooker; how a pressure cooker actually works; and the history of pressure cooking. She also shares how to choose a pressure cooker, the most important features to consider, using stovetop cookers on different types of heat sources, and whether or not it's a good idea to have two pressure cookers; and what size or sizes you might need. In Chapter Two, Jill gives you the basics of how different pressure cookers work; what a pressure cooker can do; and everything you need to know about timing; each step of the cooking process; adjusting recipes for electric cookers; adapting slow cooker recipes to the pressure cooker; and notes on vegan ingredients. Chapter Three is a whole chapter on making your own seasonings-- yay! Subsequent chapters have mouth-watering recipes for Grains; Beans; Vegetables; Soups; Main Courses; Burgers, Patties, and Savory Cakes; Toppers (Sauces, Fillings, and More); Appetizers; and Desserts (Yes!). The appropriate chapters have really helpful "At-a-Glance" cooking charts for Grains and Rice, Beans, and Vegetables. And, I have to tell you-- I've used charts from other books and ended up with over-cooked food. Jill's charts are much more realistic and accurate. 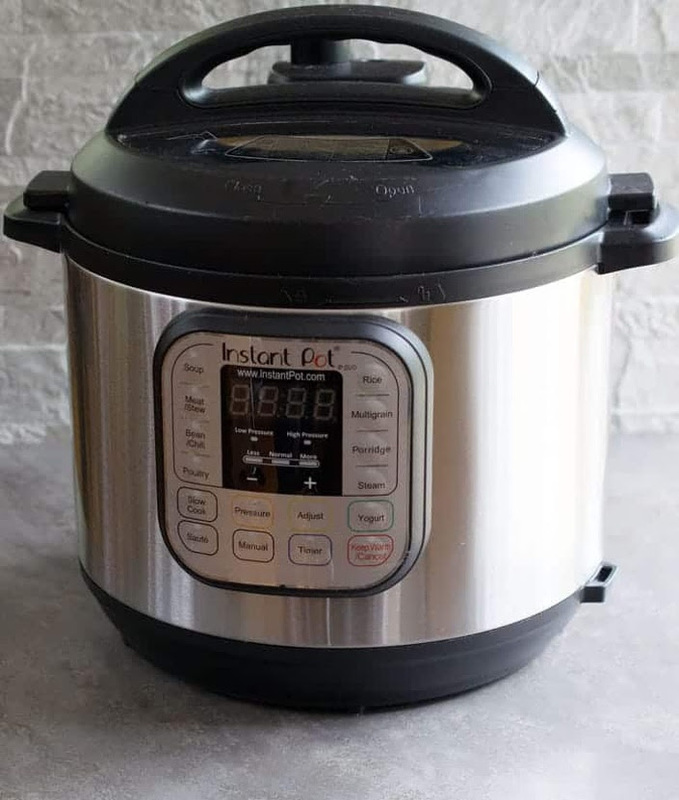 **I am now a big fan of steaming potatoes in the pressure cooker/Instant Pot, using Jill's timing chart. You put 1/2 to 1 cup of water (I use boiling water from my electric kettle to speed things up) into the pot, add the steaming basket and pile in the potatoes-- peeled or not, whole or cut. Diced potatoes for making fat-free hash-browns under the broiler take 2-3 minutes; large chunks of potatoes for a mash take about 5 minutes; whole large potatoes take about 10 minutes; and so on. This saves alot of fuel (and water) compared to boiling or even steaming potatoes in the usual way on a stove, and you preserve nutrients. I look forward to trying many of the other recipes in Jill's new book as the seasons roll on. A quick, easy, colorful and tasty meal-in-a-bowl with steamed brown rice or, perhaps, cooked noodles. Jill's method of cooking the tofu in some of the flavorings so that it absorbs flavor is a great idea. Jill's Sweet and Spicy Red Pepper Sauce recipe is in Chapter Three, but I didn't have all the ingredients, so I used a combination of Thai Sweet Red Chile Sauce and Sriracha Sauce instead. You can add more Sriracha at the table if you like it really spicy. This crowd-pleasing recipe is a simple and delicious way to prepare tofu, which gets firmer under pressure and absorbs the flavors of the cooking liquid. It cooks very quickly. It’s best to cook the sugar snap peas on low pressure for just a minute so they don’t become mushy. The sweet and spicy sauce at the end makes it even more special. Serve this over any type of rice or other grain. 1. Heat a stovetop pressure cooker over medium heat or set an electric cooker to sauté; add the sesame oil. Add the onion, carrot, and sweet potato and sauté for 2 minutes. Add the garlic and 1 tablespoon of the sesame seeds and sauté another minute. Add the tofu, tamari, vinegar, and stock. 2. Lock the lid on the cooker. Bring to high pressure; cook for 3 minutes. Quick release the pressure. Carefully remove the lid, tilting it away from you. 3. Add the peas and lock the lid back on. Bring to low pressure; cook for 1 minute. (If you do not have a low pressure option, lock the lid on and let sit for 2 to 3 minutes.) Quick release the pressure. Remove the lid, carefully tilting it away from you. 4. Stir in the pepper sauce and tahini, if using. Garnish with the remaining 1 tablespoon sesame seeds and the chopped scallion and serve. Variations: Use broccoli florets or 1-inch pieces of green or wax beans instead of the peas. Cook at low pressure for 2 minutes with a quick release. Text excerpted from Vegan Under Pressure, © 2015 by Jill Nussinow. Reproduced by permission of Houghton Mifflin Harcourt. All rights reserved. 4 C’s Warm Rye Berry Salad; Photo © Lauren Volo. The rye is chewy and even a little sweet-- I found it very pleasant and a great match with the cabbage and caraway/mustard flavoring. Instead of dry-sauteing, I cooked the onion and cabbage in a covered Pyrex casserole in the microwave on High for 5 minutes, then just dumped them into the Instant Pot with the soaked rye berries, caraway seeds, bay leaves, and stock. I would like to try this with farro or oat groats, which probably would not need to be soaked first. 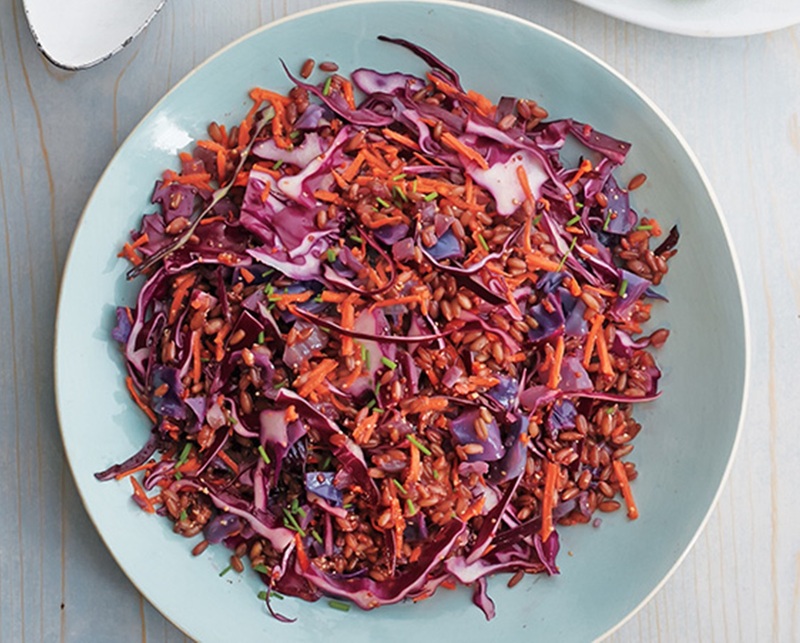 This hearty salad tastes great but has very simple ingredients, including cabbage, caraway, carrots, and chives. If you’ve never cooked rye berries before, you might be surprised by their firm texture and amazing flavor. 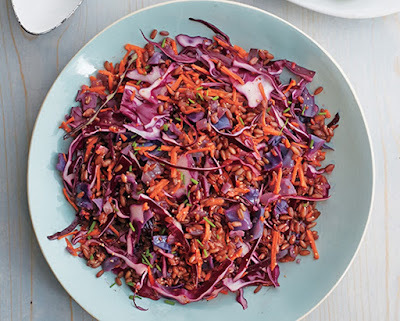 You can also make a salad with other whole grains such as farro, Kamut, spelt, wheat berries, or—if you want it to be gluten-free—whole oat groats. 1. Heat a stovetop cooker over medium heat, or set an electric cooker to sauté. Add the onion and the 1½ cups chopped cabbage and dry sauté until the onion starts to look translucent. Add water by the tablespoon as needed to prevent any sticking. 2. Add the rye berries, caraway seeds, bay leaves, and stock. Lock the lid on the cooker. Bring to high pressure; cook for 25 minutes. Let the pressure come down naturally. Remove the lid, tilting it away from you. 3. Carefully remove and discard the bay leaves. Transfer the grain mixture to a large bowl and let cool until almost room temperature. Once cool, drain and discard any remaining cooking liquid. 4. Combine the mustard, date or maple syrup, and lemon juice in a small bowl. Add the dressing to the cooled rye. 5. Stir in the sliced cabbage, carrot, and chives. Add salt (if you like) and pepper to taste. Serve immediately or store in the refrigerator for up to 5 days. Taste and adjust seasonings before serving. This is the first time I have cooked beets for a salad after simply scrubbing them before slicing-- usually I peel them first, or I roast them in foil with the skins on and then peel the skins off under running water. Simply scrubbing them well (I used a new stainless steel scrubber) is a brilliant idea! Another brilliant idea is cooking the beets in some of the flavoring elements (orange juice, vinegar, orange zest) that would ordinarily go into the dressing, which would be added to the beets after cooking. With Jill's method, the beets are infused with some of the dressing flavorings as they cook. Genius! Cooking beets has never been easier. They become so tender that you don’t even need to peel them if you don’t want to. It’s best to use young beets that are no more than 3-4 inches in diameter. 1. Scrub beets. Remove tops, stems and tails and cut in half. Then cut into ¼-inch slices. 2. Put the orange juice, vinegar and the large slices of orange zest into the cooker. Add the beet slices. Lock on the lid. Bring to high pressure. Cook for 3 minutes. 3.Let the pressure come down naturally for 7 minutes, then release any remaining pressure. 4. Open the lid, tilting it away from you. Remove the large pieces of orange zest. Stir in the Sucanat and mustard. 6. Remove the beets from the cooking liquid and transfer to a bowl. Let cool for at least 5 minutes. 7. Mix the orange zest and green onions with the beets. Pour the liquid from the cooker over the beets. 8. Spoon one quarter of the mixture onto one half cup of spicy greens on individual salad plates. 9. Or, you may chill the beets, without the zest and green onions, and let sit in the liquid for a day or two. 10. Right before serving stir in the orange zest and green onions. Excerpted from VEGAN UNDER PRESSURE, (c) 2016 by Jill Nussinow. Reproduced by permission of Houghton Mifflin Harcourt. All rights reserved. Peruvian cuisine is a delicious and exciting melange of indigenous Inca cuisine and ingredients, mixed with Spanish, Italian, Chinese, Japanese, West African, and even German influences. I never tire of exploring it. Of course, some of my interest is because my late father, Alejandro Jaime Urbina was Peruvian and I still have family there. Today I'd like to share a version I just made of one of Peru's most famous dishes, which also happens to be quick and easy to make, and very delicious. 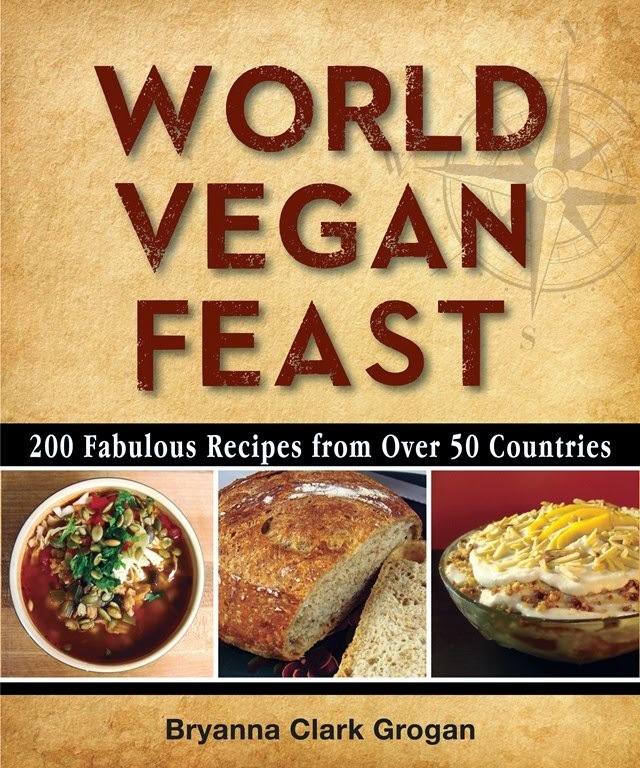 My book "World Vegan Feast" contains a recipe for vegan "Lomo" Saltado, sometimes called Peru's "National Dish". It's a Chinese-style beef and vegetable stir-fry with some piquant Peruvian accents (chilies, vinegar, cumin and sometimes cilantro), but other versions are available now, including vegan ones. Saltado dishes are commonly known in Peru to have a definite Chinese culinary influence. (The culinary term saltado is unique to Peru, and doesn't exist in other Latin countries.) 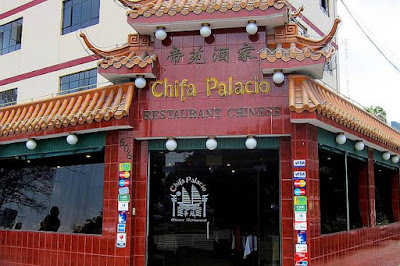 The term Chifa is used in Peru to refer to Chinese-Peruvian cooking, in which Peruvian and Chinese ingredients are fused to Cantonese culinary tradition. It also refers to a restaurant where this type of quick, hearty, cheap and nutritious food has been served to workers for over 200 years. Now Lomo Saltado (and other versions) is considered a national dish in Peru and people make it home, too. Chinese immigrants came to Peru mainly from the southern province of Guangdong and particularly its capital city Guangzhou in the late 19th and early 20th centuries. They settled for the most part in the coast of Peru and the capital city of Lima. Chifa has become one of the most popular types of food in Peru and there are thousands of Chifa restaurants across all districts of Lima and throughout other Peruvian cities, with sometimes many Chifa restaurants operating in close together on a single city block. 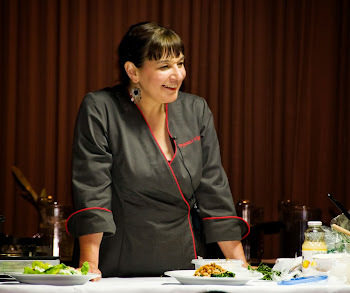 Peruvian chefs now commonly use products used in traditional Chinese cooking such as ginger, soy sauce, scallions, and a variety of other ingredients. NOTE: Saltado is generally served with both rice (which is a Spanish as well as Asian import), as well as French fries piled on top. Peruvians often serve rice and potatoes with meals at the same time. I didn't serve this with French fries this time-- but it's really good either way. If you are also serving French fries with the dish, prepare them right before doing the stir-fry and keep them warm in a low oven, spread out on a baking sheet. Heat the sesame oil in a large heavy skillet or stir-fry pan over medium-high heat. Meanwhile, mix the Soy Curls with 1 1/2 Tbsp. of the soy sauce, garlic, chile paste and cumin. Add the Soy Curls mixture to the hot oil and stir-fry for a few minutes. Remove from the pan to a dish. Heat the remaining oil in the same pan. Add the onion and green beans to the oil and stir-fry briefly. Add a little water (a tablespoon or two), cover and cook until the beans are crisp-tender-- it won't take long. Add the remaining 1 1/2 Tbsp soy sauce, the red wine vinegar and broth, and the optional cilantro, if using. Stir briefly and serve immediately with the rice and, if you're serving the French fries, top the Saltado with a small heap of them. PS: This Saltado may seem dry compared to many other stir-fries, but, trust me, it's full of flavor! Nutrition (per serving): 217 calories, 84 calories from fat, 9.6g total fat, 0mg cholesterol, 742.9mg sodium, 535.8mg potassium, 21.7g carbohydrates, 8.4g fiber, 6g sugar, 14.2g protein. This is going to be a quickie blog post! I'm trying to use more cabbage this winter, due to the rising price of veggies in my neck of the woods. (The low Canadian dollar is having an effect on food prices.) This type of casserole is fairly common, but, not only did I want to make a vegan version (of course), but I wanted to use more cabbage and less fat than usual. It was a hit! The little bit of dark sesame oil is a must for rich flavor. I will be making this again! This recipe can be doubled and baked in a 13 x 11" baking pan. It can serve as a main dish or a side dish. Either steam the potatoes or microwave in a covered microwave-safe casserole (no water necessary-- 5 or 6 minutes) until just firm, but not soft. Set aside. Brown the tofu in a lightly greased large skillet or on a baking sheet under your oven's broiler (watch carefully). Remove from pan. Dice it after it cools. Add the vinegar to the cabbage and stir to de-glaze the pan. Add the cooked potatoes and "bacon", the nondairy milk and breadcrumbs. Season with salt and pepper and a few s to taste. Spread the mixture into a lightly-oiled 9 x 9" baking dish and top with the vegan cheese. Cover loosely with aluminium foil. Bake for 30 minutes, remove the foil and bake 10 minutes longer. Nutrition (per serving): 307 calories, 134 calories from fat, 15.2g total fat, 0mg cholesterol, 260.4mg sodium, 837.1mg potassium, 34.6g carbohydrates, 6.6g fiber, 7.3g sugar, 11.2g protein. I had some leftover no-knead pizza dough in my refrigerator yesterday. We had our fill of pizza for a while, so I considered freezing the dough, but then thought, "Why not try making a couple of baguettes out of it?" Why not, indeed. It's a similar simple dough (see the recipe for the dough at the end of this post). I have a baguette pan, but it has a hook on one end, which makes it difficult to place inside even my largest roaster. I decided to line the baguette pan with 3 layers of foil, line the troughs with baking parchment and let the dough rise in that setup (for about 2 hours because the dough was cold). When I heated up the oven (to 450 Degrees F), I also heated up my big rectangular granite ware roaster. I stretched and folded the refrigerated dough a few times before shaping it into two loaves. When the time came to bake, I slid the foil form out of the baguette pan onto the bottom of a baking sheet and then carefully slid that into the shallow bottom of the hot roaster. The foil kind of spread outward at this point, so I quickly rolled up some more foil into two long "sausages" and used those to prop up the outside edges of my makeshift baguette pan liner (I saved all this foil for another use, BTW). I scored the tops of the dough with a serrated knife before baking, but not deeply enough, evidently, because you couldn't see the scoring at all after it was baked (I'll use a razor blade on the soft dough next time). However, as you can see, it turned out well, had wonderful flavor (it was in the refrigerator for 2 nights), and disappeared very fast with a vegan stew I made for friends who came for dinner. This is our current favorite pizza dough-- partly whole wheat and no oil added, but very tender. In a large bowl, mix together the two flours and the salt. In a 1-quart/L container, sprinkle the yeast into the water and let sit for a few minutes. Stir and pour into the flour mix. Have ready another large bowl, oiled lightly. Stir the mixture with a Danish dough whisk or large spoon. Use your hands to mix/knead in the last bit of flour. Using a dough scraper, scoop the dough into the oiled bowl. Cover and let rise at room temperature for 2 or more hours (this is flexible). Refrigerate in the same bowl, either covered, or placed inside of a food-safe plastic bag (it won't touch the dough if the bowl is big enough), or in a covered container such as a dough bucket or large storage container. Place in the refrigerator. You can keep the dough in the refrigerator for about 2 weeks, although, in my experience, it gets kind of "soggy" by then. It does taste marvelous after a long stay in the refrigerator! Make as many pizzas as you like (refrigerate any leftover dough again) as usual and bake at the highest heat your oven can reach (500-550 degrees F) for 8-10 minutes, using a baking stone or cast iron skillet heated up in the oven as it comes up to temperature. Nutrition (per 1/6th of one square 11-inch pizza): 93 calories, 3 calories from fat, less than1g total fat, 0mg cholesterol, 189.1mg sodium, 47mg potassium, 19.6g carbohydrates, 1.2g fiber, less than 1g sugar, 3g protein.